Back in 2014, Matt from Auto Express decided to take his own Mazda MX-5, add some custom parts, including a supercharger, to see if he could beat a (then new model) Porsche Boxster around their track. It's not often you see a relatively traditional motoring journalist showcase modifications to their own cars so watching this is pretty cool. 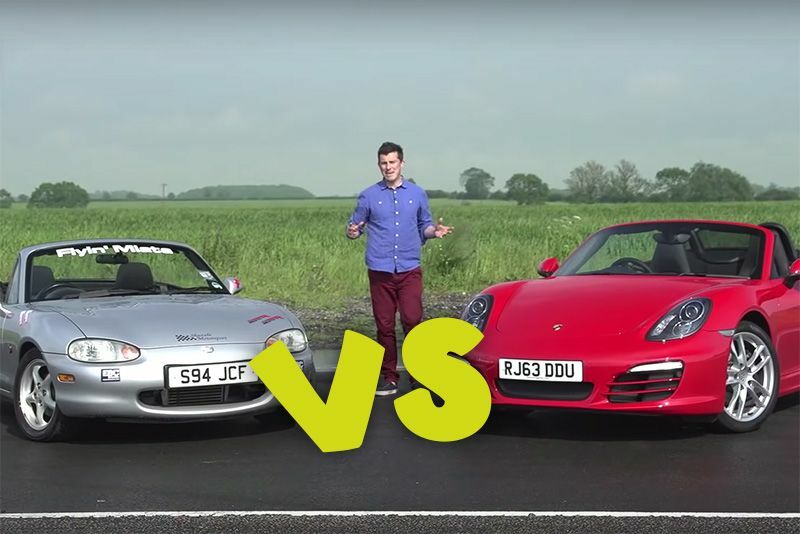 Auto Express' Matt, took his 15-year-old Mazda Mx-5 (Miata) and did just that... and then challenged a Porsche Boxter to a track duel. Modifications to the little Mazda included a supercharger kit with ECU controller, intercooler, bigger injectors and exhaust manifold, a better clutch and lighter flywheel for a 50 to 60hp extra kick in the pants. To help the new Yokohama tyres deliver the uprated performance to the tarmac, he fitted adjustable coil-over suspension, perfect for both track and everyday use, while better brake disks, callipers and pads helped to bring everything to a halt. But, is spending £4,000 to upgrade this £1,000 vehicle enough to take the little Mazda anywhere near the mighty Porsche's lap time? Well, you'll have to hit the play button to find out.